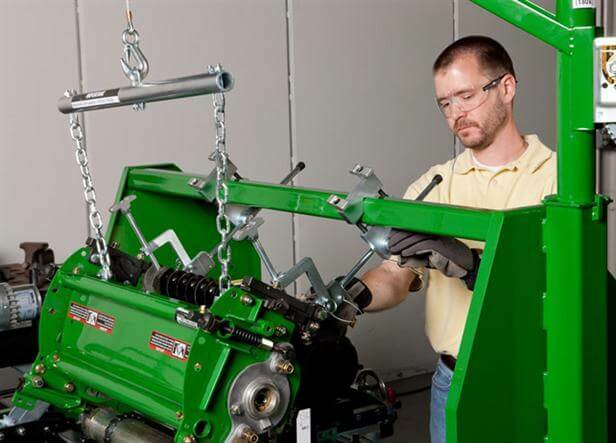 Whether to spin grind or spin grind with relief is always a hot topic of discussion at golf course maintenance facilities worldwide. No matter which school of thought is preferred, the RG5000 Manual Spin and Relief Reel Grinder can perform both functions with quality and precision. The RG5000 can be used as a standalone spin grinder, or with the standard auto-indexing relief system, a relief grind can also be completed as part of the grinding process. By having a relief grinding system standard on the grinder, reels can be restored quickly and easily to manufacturer's specifications. This flexibility gives the golf course customer ultimate control over cut quality and allows for developing a maintenance program that works best for varying conditions.